Microgreens are baby plants, harvested when they are about 2" tall. Our producer Danny has been experimenting with growing peas, broccoli, kale, and sunflowers as microgreens. They taste like baby versions of the grown-up plant- so pea microgreens taste sweet like peas and radish microgreens are a little spicy like radishes. 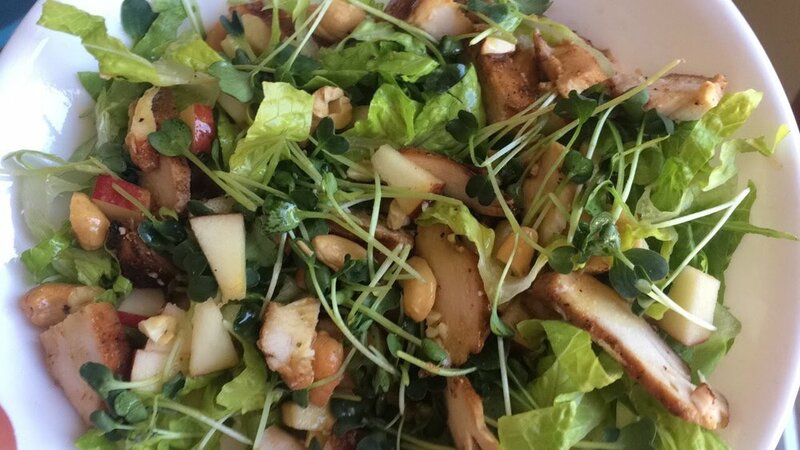 Lettuce, microgreens, carrots, bell peppers, turkey, and pine nuts in this salad. Romaine wrap with turkey, cheese, sundried tomatoes, microgreens, and dressing. I don't know about you, but sometimes I struggle with staying motivated to make healthy choices. I know I SHOULD, but it's hard to stay enthusiastic and it's easy to forget how important each decision is. Since I've started going to Inspired Chiropractic, I've been so encouraged and inspired by what Dr. Neil has taught me and I wanted him to share that with you! 1:40- The #1 cause of death doctors don't want you to know. (Book referenced: Death by Medicine). 2:53- How to find the motivation you need to make healthy choices. 4:00- How to resist the temptation of fast food. 4:44- How many days does the damaged fat from french fries stay in your body? After watching the video, I'd love to hear your "WHY"- the reason you want to be healthy. Leave a comment if you care to share! P.S. If you are looking for a chiropractor, I highly recommend Inspired Chiropractic. His practice does a great job of integrating and teaching about whole lifestyle, rather than just focusing on adjustments.